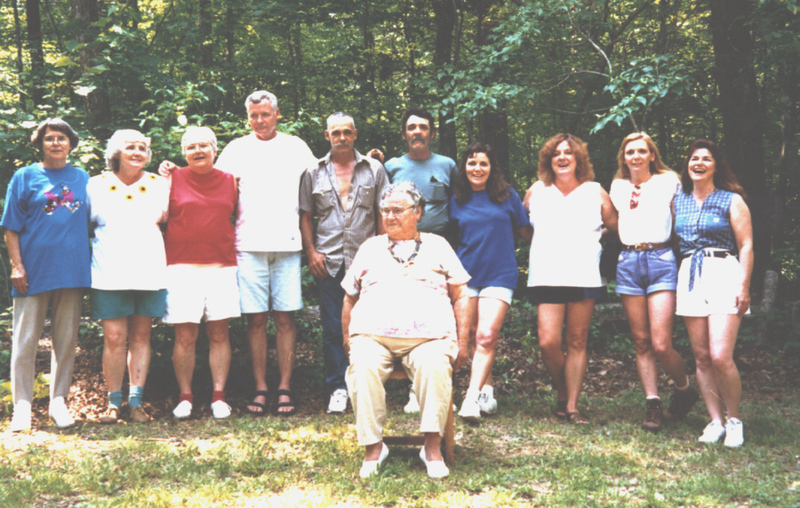 eptember 14, 1991 -- Twelve adults and five children were together at Hoyt’s house between Newport and Dandridge, Tennessee where Bill lived. Mama (Louise Frasier); Virginia, Charlie, and their daughter, Karen and her daughter, Alishia; Hoyt and his wife, Barbara, their daughter, Sissy and her children Brian and Katie; Rusty and his wife, Cherie and their sons, Josh and Justin; John, Bill, and Margie. For dinner we ate chicken, home grown green beans, okra, potato salad, deviled eggs, sliced tomatoes, banana pudding, and apple pie. And for desert—ice cream cones, vanilla, chocolate, and strawberry. While Barbara, Karen, and Sissy fixed places to sleep Mama, Virginia, Hoyt, Bill, John, and Margie sat on the back patio and laughed and remembered for a couple of hours. Rusty and his family slept in one bedroom. John and Bill slept in another—Bill on the bed and John on the floor. I slept on a single bed with Margie, Karen, Alishia, Sissy, Katie, and Brian all over the floor. Katie rubbed Margie’s hair all night. Charlie, Virginia, Hoyt, and Barbara slept on the floor in the living room. Sunday morning Virginia and Hoyt went to the store to get more coffee. We had eggs, sausage, bacon, biscuits, and gravy for breakfast—with three kinds of home made jelly. We had a very good time! Guess that’s what we used to eat and how we all slept when we all got together. No one finicky or ‘touch-me-not’. Everyone - not male or female. “Come on over about three o’clock and we’ll make home-made ice cream.” In the hand cranked freezer—whole milk with an extra pint or two of heavy cream plus six or twelve eggs per gallon. Fresh fruit if it is available—peaches or strawberries. Once, after we’d had two gallons of home made ice cream and all the kids were in the barn loft sleeping (when we lived in the barn) Vernon said, “Now all the young’ns are in bed, lets make a gallon for us. Four of us. We put four bananas in it. Yuck! Vernon got so sick that he almost died. Once Hoyt and Bobby decided some black walnut ice cream would be good and they would do it all by themselves. Just the smell of that ice cream is still with me. I’ve never liked black walnuts since! Anyway, one of the things that we remembered was that after Margie started to school (Virginia, Dot, and Carrie gone now) the two babies, Evelyn and Martha, and me were alone all day. I had baked a birthday cake for someone and had it on the table. I was in another room ironing. Suddenly, I realized I didn’t hear the babies. I hunted everywhere. I came back in the house and saw the cake gone. I heard giggling from under the table and lifted the table cloth. They were sitting under the table licking the cake and giggling. He said, “Daddy’s cigarettes. We got them out of the desk drawer and put them in a can and hid them in a tree.”—The three boys and their cousin, Bobby. I asked Hoyt and Bill and they first said no. Than they said yes, but if I wouldn’t tell Daddy, they’d never smoke again. I did not tell their Daddy, but Vernon did. Daddy asked them and Bill said yes. Hoyt said no. Daddy begged Hoyt to tell the truth, but he kept saying he didn’t smoke. Daddy took Hoyt to the little old back porch and whipped him with that double razor strap. Town Creek church was about ¼ mile away and I’ll bet they heard him screaming and thought he was shouting. He’d start screaming before you got within two feet of him. You couldn’t hit him without hitting him in the head.